N-Button software Automation feature allows you to control a relay board using a push notification contact closure controller. That means you can match input channels on push notification boards with relay channels on relay boards to turn on/off relays by changing the status of input channels. 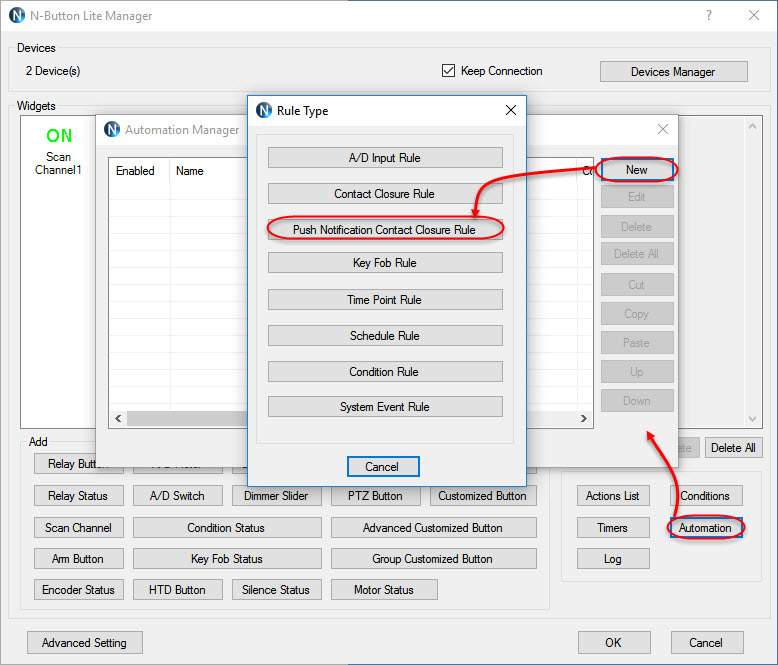 Here we will show you how to turn on and turn off relays with push notification buttons using N-Button Lite software. Step 1. 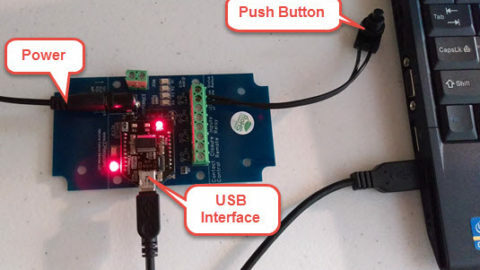 Plug in power and connect your relay board and push notification board with your computer. Step 2. 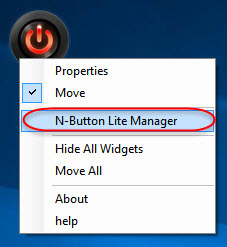 Download, install, and run the latest N-Button Lite software to show N-Button Lite Manager panel. Step 3. 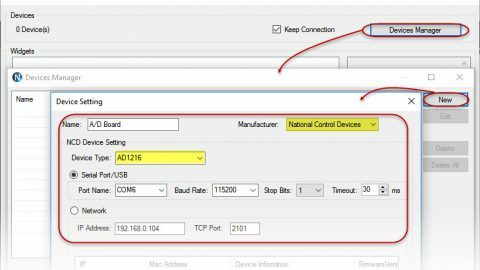 Click Devices Manager –> New to add relay board and push notification board to Devices Manager. 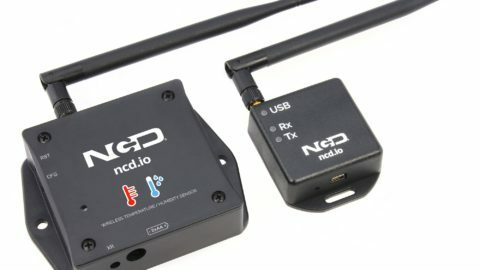 Note: Click the link below to get more information about how to set up push notification board with N-Button. Step 4. Click Scan Channel to open Properties – Scan Channel. Note: In this example, the Style is “Text Label”. You can input a Caption if you prefer. The default caption is Close and Open for input channel contact closure or not. 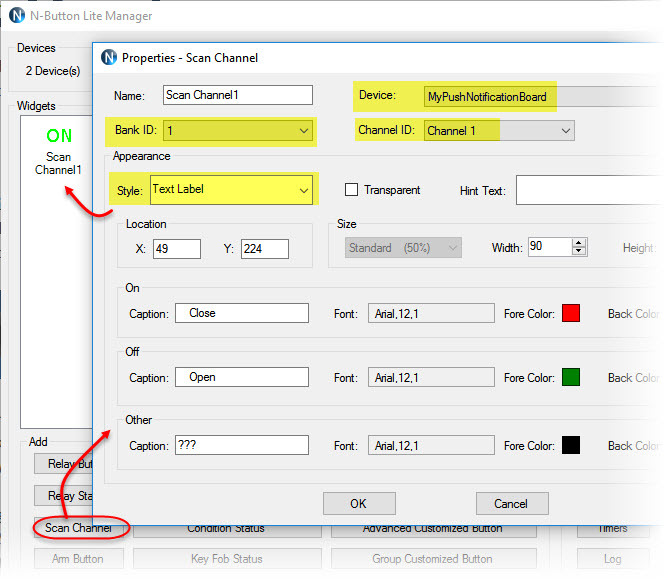 You can also select other Style for Scan Channel to show red or green when the channel is contact closure or not. Step 5. Repeat Step 4 to add another Scan Channel widget for Channel ID 2. Step 6. 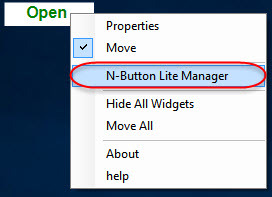 Click OK on N-Button Lite/Pro Manager. Two Scan Channel widgets will be shown on your desktop with caption Open on them. Press the push button to change the channel to closure, you will see caption Close showing on the widget. That indicates the push notification board works well with N-Button. Step 7. Right-click on one of the Scan Channel widget to show popup menu, click N-Button Lite Manager option to show N-Button Lite Manager panel again. 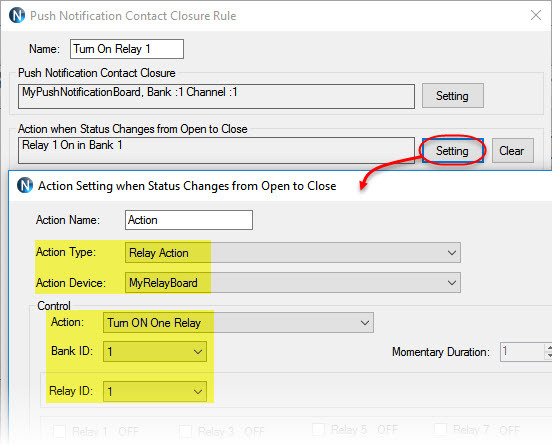 Click Relay Button to open Properties – Relay Button. Select Style, which will show relay status. Step 8. Click the Relay Button widget on your desktop to turn on/off relay. The relay status will be shown on the button, green for on and red for off. That makes sure the relay board works well with N-Button also. Note: I only have one Relay Button added with action Toggle One Relay. You can add two Relay Buttons, one for Turn On One Relay, another for Turn Off One Relay. You can also add Relay Status widget just show the status of relay channel 1. Step 9. 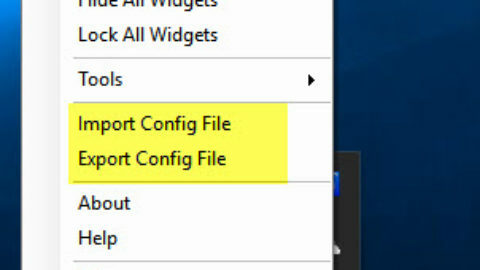 Right-click on any widget to show popup menu, click N-Button Lite Manager option to open the manager panel again. Click Automation to open Automation Manager panel. Click New to show Rule Type panel. 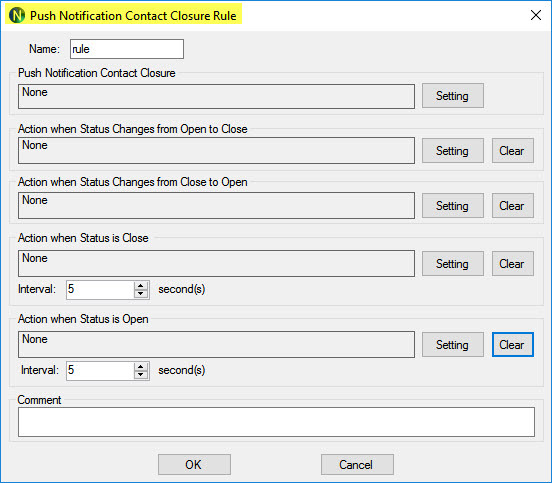 Click Push Notification Contact Closure Rule to open setting panel. Channel ID 1, which you will use to trigger relay channel 1. Step 12. Click OK on above panels back to Automation Manager panel. 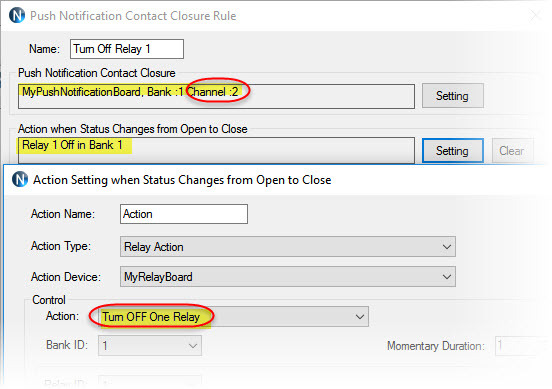 Follower the Step 9-11 to add another Push Notification Contact Closure Rule for Channel 2 to turn off relay channel 1. 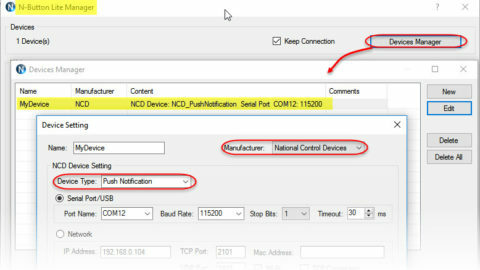 Be sure you select Channel 2 on MyPushNotificationBoard, and Turn Off One Relay for control action. Step 13. 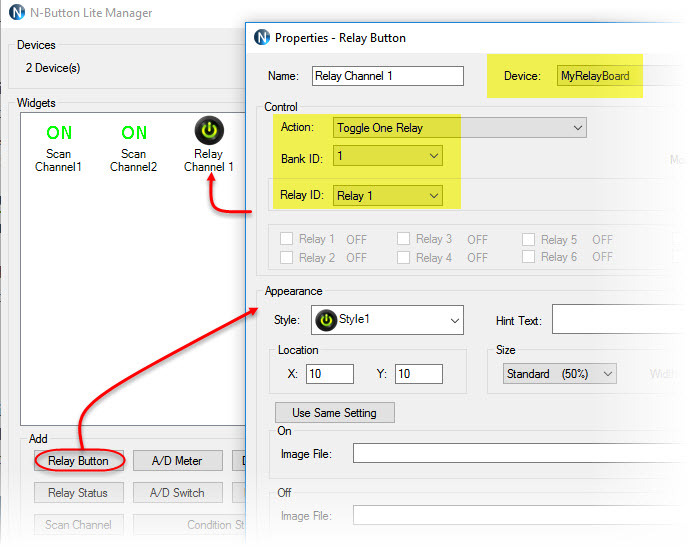 Click OK on all above setting panels to finish Automation control setting until you see the Scan Channel widget and Relay Button widget on your desktop. Step 14. Try to press push button 1 and 2. You will see the relay 1 is turned on by pressing push button 1, and turned off by pressing push button 2. 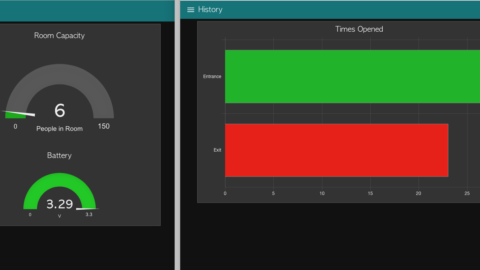 Above is just a simple application for relay board, push notification board together with N-Button software. 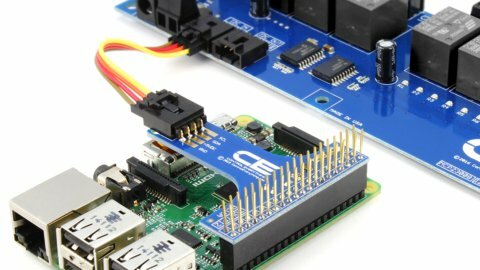 You can have different configuration with other boards and N-Button automation rules to achieve more applications.